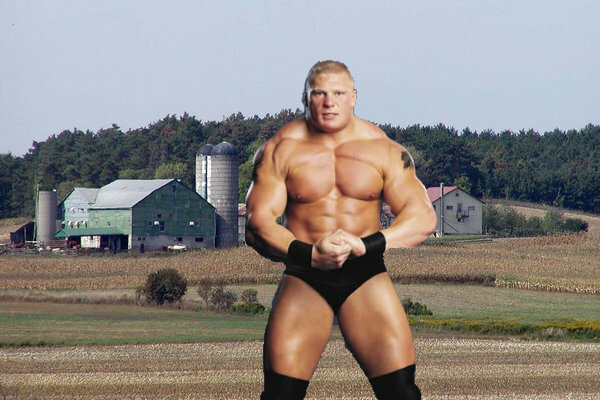 Stone Cold inquires about Brock's life growing up on a farm and references an interview he read where Lesnar said that if you can cut it on a farm you can cut it anywhere. He says that in rural South Dakota where he grew up there was no extra money, and all their income was based upon how well their cows and fields produced, calling it a way of life. Austin calls it "a lot of d*mn work" and Brock agrees, saying you're married to it no matter what. It doesn't matter if it's raining, sleeting or snowing, you have to get up at the crack of dawn and go milk those cows, and he's applied that work ethic to every stage of his life. The two then joke about how they've never been hunting together and need to get it done. Austin asks about his schedule and the two promise to link up and kill some animals.